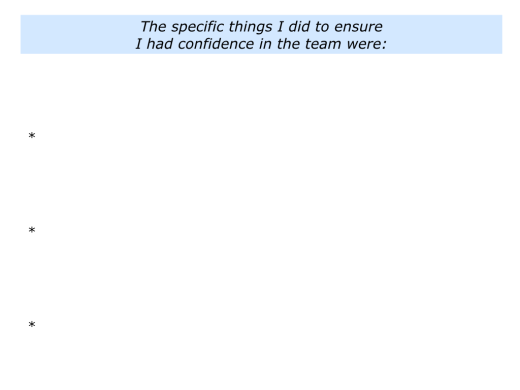 What made you confident that the team could do good work? What did you do to prepare the team properly? 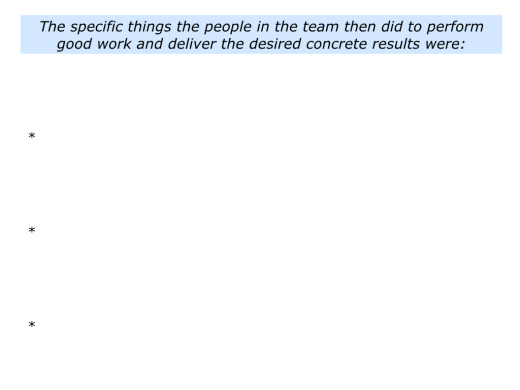 What did the team then do to perform good work? There are many models for building and preparing a team to perform at its best. One approach is to focus on the following themes. You can make sure that people are clear about the team’s goals, strategy and their parts in achieving the picture of success. You can make sure that you have the right people with the right character and competence – the right attitude and ability. You can then put them in the right places to deliver the goods. 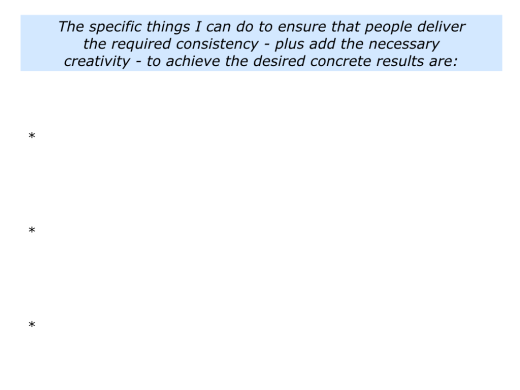 You can do your best to make sure that people deliver the required consistency – plus add the necessary creativity – to deliver the required concrete results. 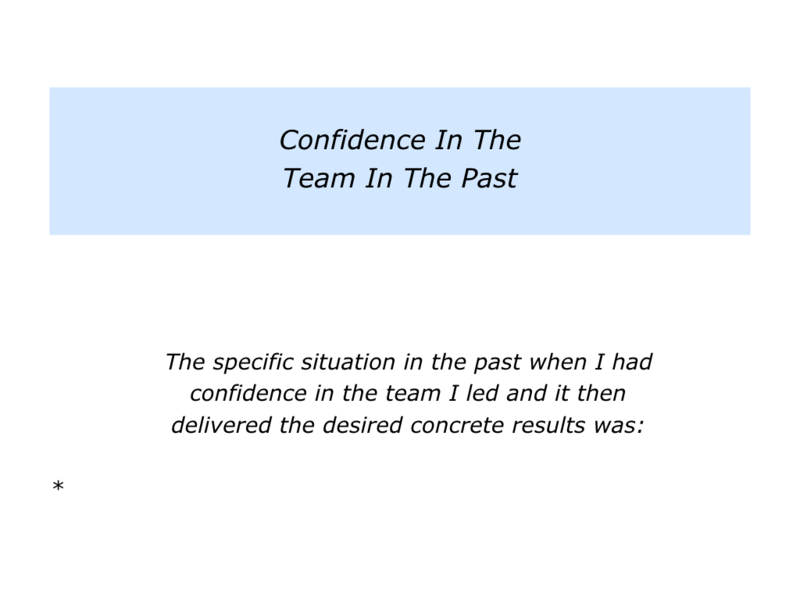 Describe a specific situation in the past when you felt confident about a team you led and it then delivered the desired concrete results. 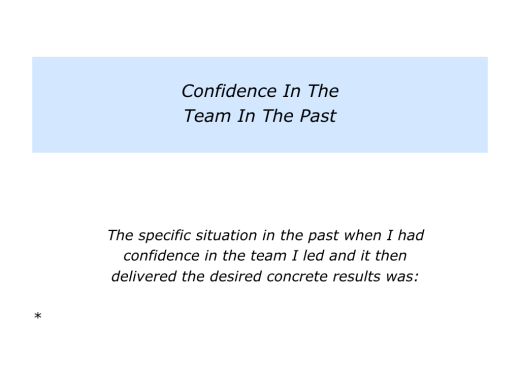 Describe the specific things you did to ensure you had confidence in the team. Describe the specific things that people in the team then did to perform good work and deliver the desired concrete results. 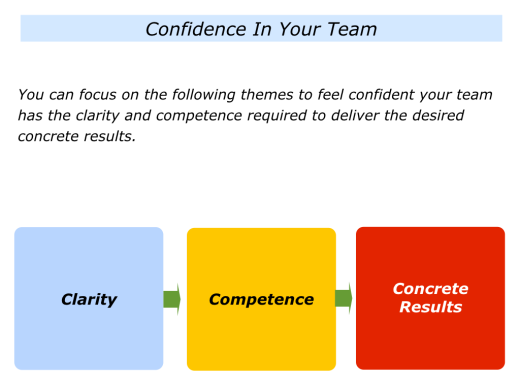 Let’s consider some of the steps you can take towards having confidence that your team will deliver the goods. Great teams implement the right strategy with the right people in the right way. Everybody knows what mountain the team is climbing and why it is climbing it. They know their parts in helping the team to get to the summit and back safely. Sports teams, paramedic teams and mountain rescue teams, for example, spend masses of time rehearsing to deliver the goods. They go through their equivalent of pre-season training, boot camp or simulation training. Great teams in education, business and other fields also prepare properly. Despite being under time pressure, they carve out time to plan ahead. They believe it is vital to ensure that their people take time to know the team’s strategy and make clear contracts about their parts in delivering success. 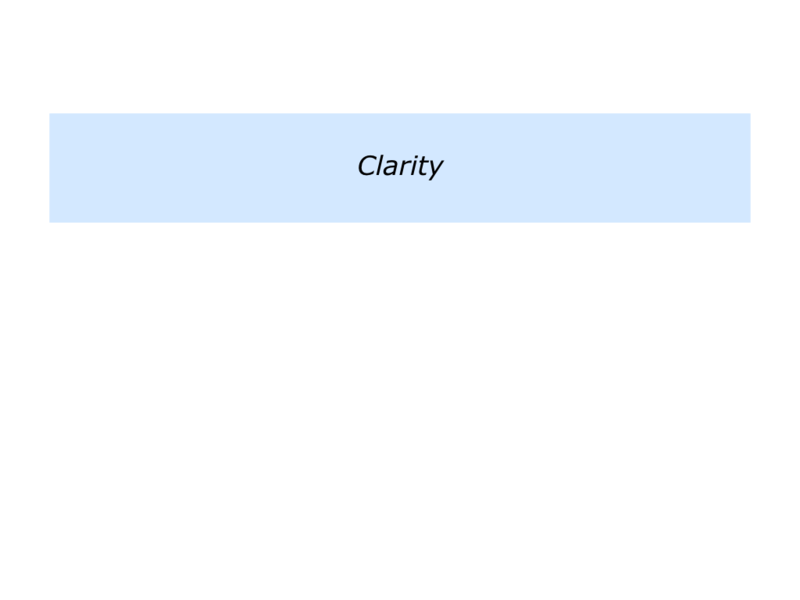 You will have your own approach to establishing clarity. Whatever approach you use, every person should then be able explain the following themes regarding the team’s plan. Imagine that you lead a team. How can you establish clarity? How can you make sure that everybody knows the plan? If you wish, try tackling the exercise on this theme. 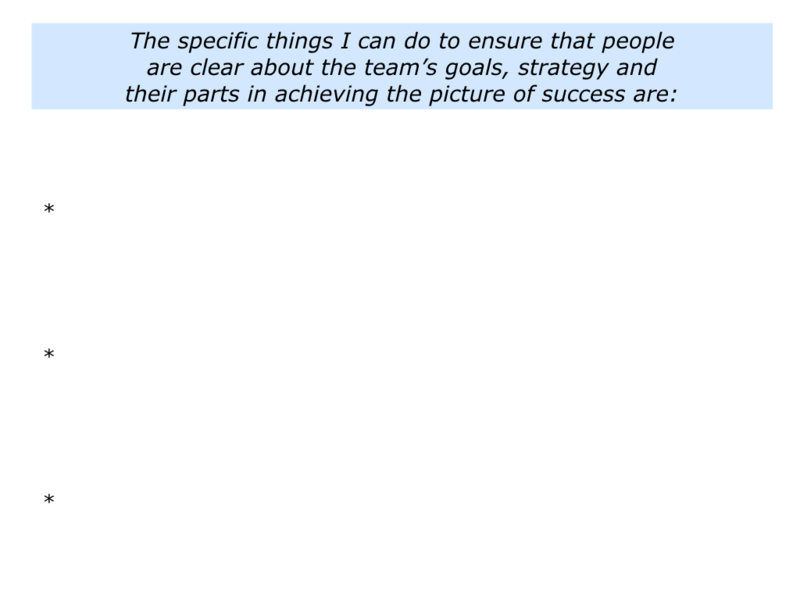 Describe the specific things you can do to ensure that people know the team’s strategy and their parts in achieving the picture of success. Great teams make sure they have the right people with the right character and competence. They then play to their strengths. They put the right people in the right places to increase the chances of delivering success. Such teams are made up of people who have similarity of spirit and diversity of strengths. They start by defining the spirit they want people to demonstrate. They get the right people with the right attitude. Attitude is non-negotiable, but they want characters, not clones. People will express the team’s principles in many different ways, of course, but they must always demonstrate high professional standards. Spirit gets people so far. But it is the diversity of strengths that enables the team to produce something special when it matters. Diversity of spirit, however, is a recipe for disaster. 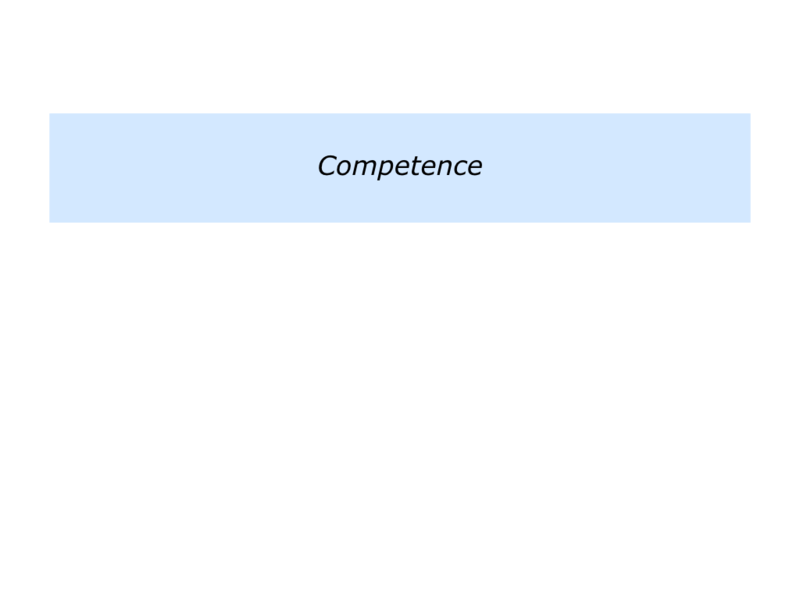 Such teams sometimes do the following exercise to clarify the character and competence they need people in the team to demonstrate. They then ensure they have people who demonstrate these qualities. Great teams play to people’s strengths. They put people in the places where they can deliver As, rather than Bs or Cs. They then co-ordinate people’s strengths – plus sometimes add other skills – to ensure the practical tasks get completed successfully. They ensure that people know how to follow the game plan. People practice implementing the strategies and also rehearse dealing with potential problems. Such teams get people to practice under pressure. 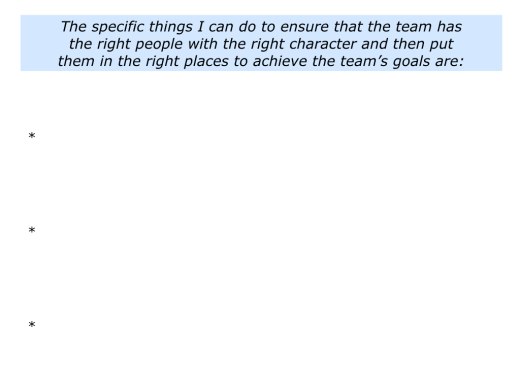 Below is a video in which Ceri Evans, a sports psychologist, describes how the New Zealand All Blacks rugby team took this step. Ceri works for an organisation called Gazing. You can discover more about their work via the following link. Imagine that you lead a team. How can you get the right people with the right competence? How can you get them to practice following the strategies? How can you enable them to perform great work when under pressure? Great teams do their best to make sure that people deliver the required consistency – plus add the necessary creativity – to deliver the required concrete results. Such teams consistently reach 8+/10. But they also encourage people to express their talents so that the team reaches 10/10. Imagine you are a leader and want to build such a team. One concern that you may have, however, is that people sometimes neglect the basics on their route to self-expression. 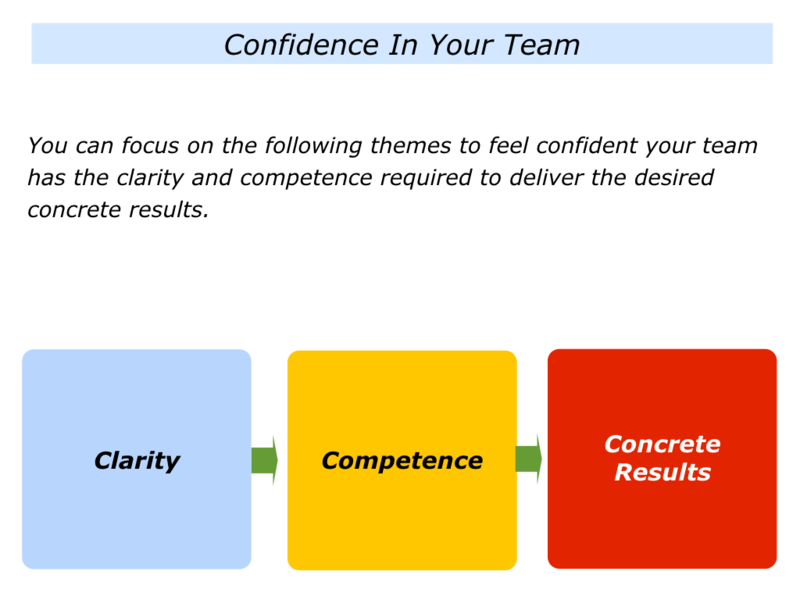 Let’s explore some steps for getting the right combination in your team. Start by gathering people together. 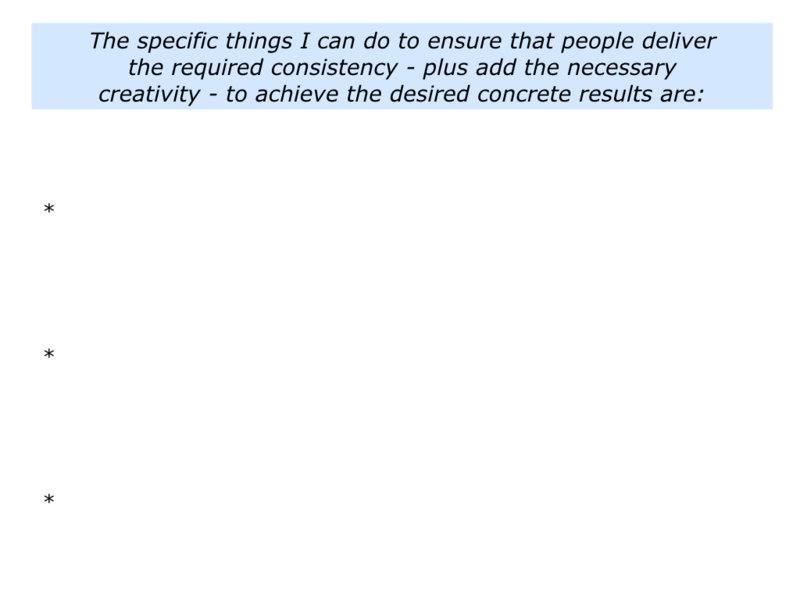 Explain how superb teams get the right balance between consistency and creativity. You can then ask them to tackle the first exercise on this theme. People are to start by describing the specific things they can do to consistently deliver good work. They can then agree on the key principles. You can then move on to the next theme. Invite them to describe and then agree on the specific things people can do to, when appropriate, use their creativity. You can give people the support they need to do the job and enable them to perform superb work. Keep showing them what good looks like. You can keep producing success stories that highlight when they have done superb work. They can then follow these principles in the future. You can also encourage them to focus on constant improvement. 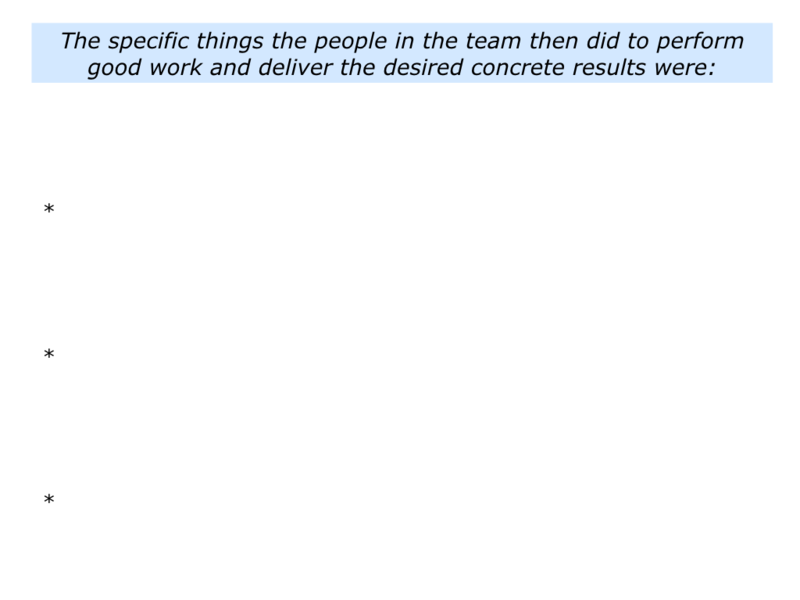 When I worked with sports teams, for example, people in the teams kept doing the following exercises. You will have your own approach to encouraging people to get some quick wins and doing superb work. Developing the ethic of constant improvement will also increase your confidence in the team’s ability to deliver the goods. If you wish, try tackling the final exercise on this theme. This invites you to describe the specific things you can do to, as far as possible, ensure your team delivers the desired concrete results.